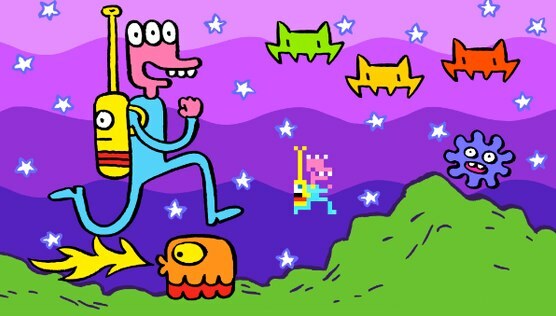 In the latest Kickstarter Podcast, I interviewed indie comics legend James Kochalka and Pixeljam Games’ Rich Grillotti and Miles Tilmann about Glorkian Warrior, their retro-inspired videogame that mixes hand-drawn and 8-bit pixel animation. James Kochalka is undeniably prolific, though he balks at the word. He’s kept a daily comic diary of his life on American Elf for the last 12 years, released 40+ books, recorded 10 albums, and just appeared in a scifi film. But he’s never made a videogame, something he’d been aching to do since he was a kid. Thanks to a chance meeting at a chiptune concert, Kochalka’s collaborating with Pixeljam Games to make it happen. Pixeljam’s responsible for some of my all-time favorite Flash games, such as Dino Run, Gamma Bros., Ratmaze, and Mountain Maniac. It’s a match made in geek heaven. Their Kickstarter project ends tonight, so get the Glorkian Warrior game, mini-comic, and other exclusive rewards while you can. Kickstarter is awesome. I love seeing that the creators of glorkian warrior will work someone into the game at the “GOD” level. It’s exactly things like this which point to kickstarter’s awesomeness. Ya. James Kochalka is undeniably a legend.